Today we plan to hike as far as a couple of creeks that appear to be flowing, around mile 1800. The day after that, there’s a final long, dry stretch of about 18 miles into Mazama Village at Crater Lake, where our first resupply box is waiting for us. The trail through the Sky Lakes Wilderness has not been cleared yet, and from the looks of it, last winter was a very windy one. We skirt blowdown after blowdown, clambering over logs, careful to avoid impaling our legs on branches, crawling under a few where space permits. There’s no way to set up a good hiking rhythm. 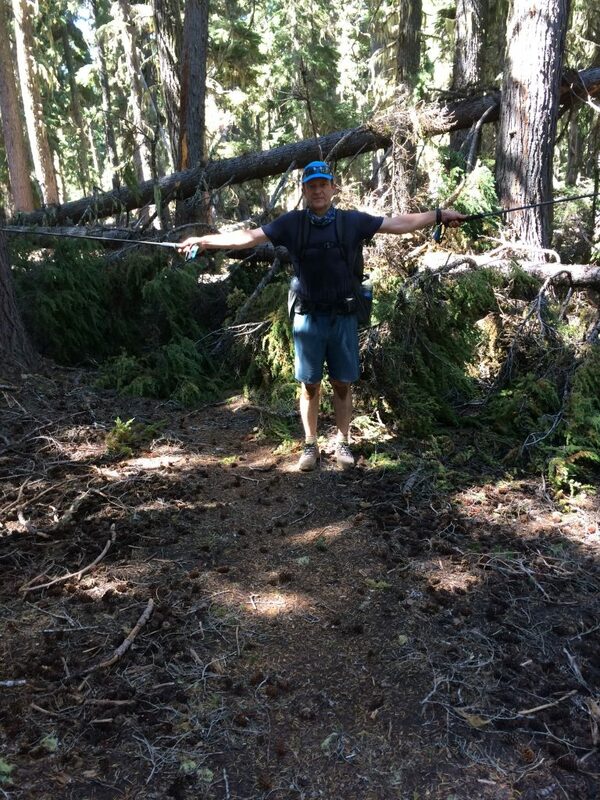 Here’s Marc posing in front of a typical mess — you can see the trail disappearing behind him under the logs. We arrive at Christi’s Spring, which I think might be a good place to take a break, but there are swarms of mosquitoes who call it home, so we quickly leave since we don’t need to fill up our bottles. A while further on we come across an older man sitting on a log, pack still on, by the side of the trail. It’s hot, and the trail is going steadily uphill. We’re topping out over 7200 feet today. We ask how he’s doing, and he expresses frustration about what a hard time he’s having. To me he looks overdressed for the heat – a t-shirt under a long-sleeved shirt, a sweatband around his temples and a hat on top of that, long pants. I used to scramble up and down these mountains all the time, he says. I don’t know why I’m having such a hard time. News flash, sir — time doesn’t stand still. Your body looks like it’s packing some extra pounds. The pack on your back is HUGE. He’s supposed to meet up with his wife at Crater Lake in a couple of days. We ask about his water. He only has half a liter left, and the next possible water source is still three miles away. In heat like this, you can sweat out a liter an hour. I top up his bottle with half a liter from mine, we tell him about the off-trail water source, and go on our way. But we’re both worried. Does he have a beacon? 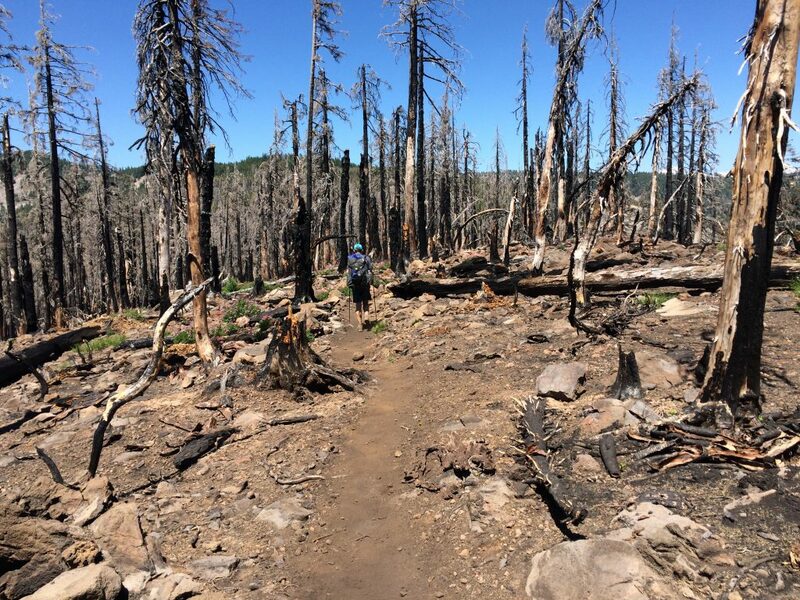 The trail winds up through some burned areas. I find them starkly beautiful. 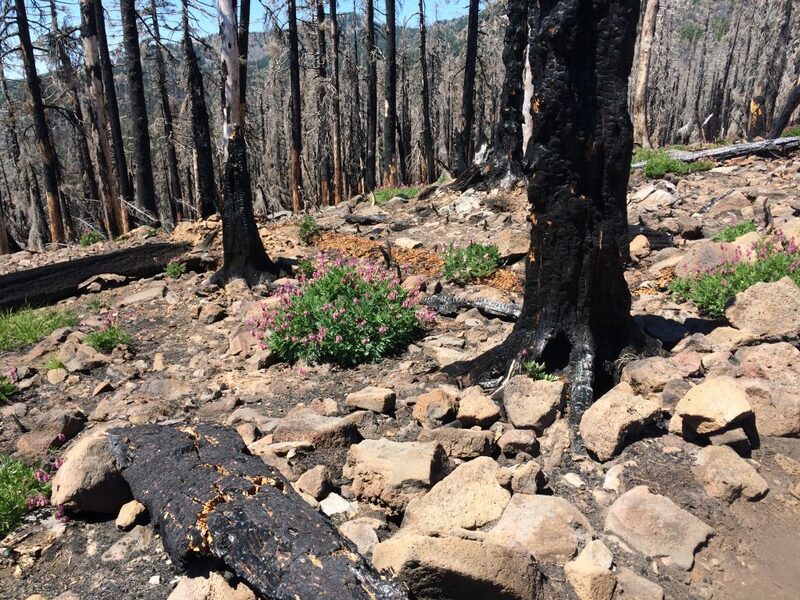 Flowers are often the first things to reappear in a burn, and this one is no exception. Their color stands out in the devastation. Finally we arrive at a kind of pass, and sit down for a break. A tru-thruer goes by, and Marc has a long conversation with him about the old guy, who he had also shared water with. He tells us that Gunther started the day at Christi’s Spring with 5 liters —and that his pack weighs 52 pounds. Ouch! We scramble down, down, getting water at the first lovely creek we cross. It’s so cold! There are tiny frogs hopping around the melting snowdrifts, and they are so cute! We’d thought about camping near the last of the creeks, but when we get there the site is occupied and we feel like we still have a few miles in our legs. It’s strange, but at 5 pm, after you’ve already hiked 20 miles, four more seems like no big deal. We cook our dinner at the creek, though, so we don’t have to carry the extra water, and strike up a conversation with two chatty guys camped there. It’s a father-son duo, each with his own tent and stove setup, section hiking. His wife dehydrated his food, and it turns out we used the same resource, the Backpacking Chef. I learn that dehydrated pineapple is great. We discuss the Crater Lake conundrum —rim alternate or “offical” PCT, and learn that there are 26 miles between the Rim Village and the next water source if you take the rim alternate. We decide to hike on to a campsite at mile 1803. It’s big enough for 5 tents, so even if others have gotten there before us, which I’m sure of, there should be enough room for us. We get there around 7:30 and there’s not a tent to be seen. All to ourselves! The extra hiking means tomorrow will be a relatively easy day, for once. The trail into Mazama Village is at mile 1819, so that’s only 16 miles. I’m looking forward to an easy day, ice cream, a shower. After that, we shall see. Marc and I are not in agreement about the 26 mile hike. I’m thinking we could hike to the point where the PCT and the Rim Alternate meet, and then backtrack 4 miles back down the PCT to Red Cone spring. That would only be like a 16-mile hike. To Marc, however, doubling up like that is unthinkable, and 26 miles is a piece of cake. Why is more always better??? Grrrr. Never mind. We cook our dinner, pack up the (now nearly empty) bear bag, and hit the sack. Because the weather has been so clear — we’ve barely even seen tiny clouds on the horizon the whole time we’ve been out here — we never put up the tent fly, and I love to wake up in the night and stare out at all the stars. There’s no moon, so they’re super bright and the Milky Way is painted in a broad streak across the sky. We never see the stars in Vancouver; no good windows, plus all the light pollution. I miss them. This entry was posted in Hiking, PCT Oregon 2016 and tagged backpacking, blowdowns, hiking, Oregon, Pacific Crest Trail, PCT by gydle. Bookmark the permalink.